Closing out its keynote at CES 2019, AMD has shown off a pre-production 3rd Gen AMD Ryzen CPU using the Zen 2 x86 architecture and built on 7nm, demonstrating its ability to outperform the Intel Core i9-9900K while using roughly 30 percent less power. While rumours continue to swirl about AMD bringing a 16-core CPU to its mainstream AM4 platform, the comparison in this instance was a fair one, with AMD pitching an eight-core/16-thread (8C16T) CPU against Intel’s own 8C16T flagship mainstream desktop CPU. The benchmark of choice, naturally, was Maxon Cinebench R15, which is famously a lover of cores and threads. The benchmark results ended with AMD just out in front with a score of 2,057 to Intel’s 2,040, while power consumption was measured at roughly 30 percent lower for AMD. Specifications for the two stock-speed test systems were not available at the time of writing, but we do know they were running at so factors like memory speed are at this stage unknown, but we are cautiously assuming equivalency. Higher performance for less power while using the same number of cores and threads is a clear win for AMD, but it’s to be expected given that third-generation Ryzen CPU cores are built on a 7nm process, whereas Intel’s desktop CPUs are still on the ageing 14nm. Little else is known – officially speaking, at least – about the new CPU family, but we do know that they will be using AMD’s Zen 2 x86 architecture and the existing Socket AM4 ecosystem. Presumably, then, existing motherboards will be forwards-compatible with the new chips. 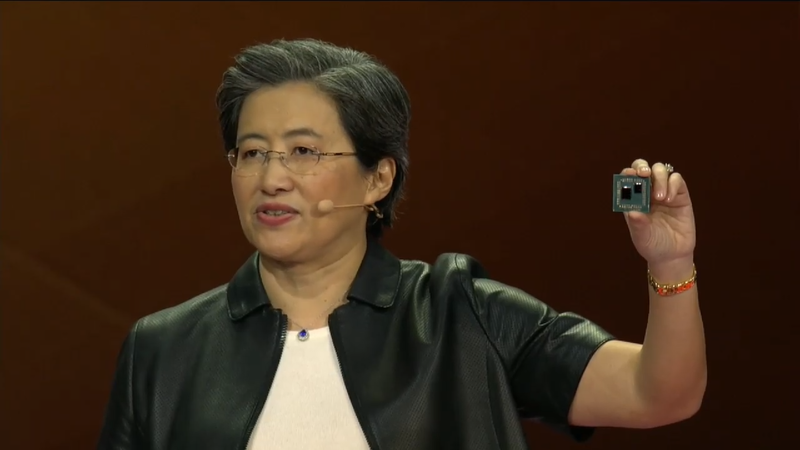 That said, these new CPUs will also bring PCIe 4.0 connectivity to the PC market for the first time, and anyone wanting to leverage that will certainly need a new motherboard to match when the chips launch, which AMD has confirmed as being mid-2019. Physically, the CPU has a very interesting design, in that it has two totally separate packages. The smaller one is one of AMD's eight-core Zen 2 chiplets built on a 7nm process, while the larger one includes the PCIe 4.0 and dual memory controllers and is built on a 14nm process at Global Foundries. Even more interesting is the fact that there is clearly a space for a second chiplet, which gives even more credit to the rumours about a 16-core AM4 processor - nothing in that regard is confirmed, however. On a related note, AMD also showed of 7nm Zen 2 in its upcoming datacentre-centric Epyc Rome processor. This time, the demonstration was of a single Epyc Rome processor (presumably the 64C128T part) offering approximately 15 percent more performance in the scientific application NAMD compared to a system using dual Intel Xeon Platinum 8180 CPUs (Intel’s flagship 28C56T offering). AMD confirmed that the Epyc Rome processor is likewise on track to start shipping in mid-2019.